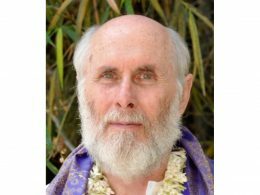 Dr. David Frawley (Pandit Vamadeva Shastri) is a Vedic teacher and Hindu Acharya. He is the author of fifty books published in twenty languages worldwide. His fields of expertise include Yoga, Ayurveda, Vedanta, Jyotish and ancient Vedic texts. He has also written extensively on historical, social and cultural issues facing Hinduism and India today. Vamadeva was honoured with the Padma Bhushan Award from the government of India in 2015. He has D. Litt. degrees (Doctor of Letters) from S-VYASA in Bangalore and Ram Manohar Lohia University in Uttar Pradesh. He has received a National Eminence Award from the South Indian Education Society (SIES) in Mumbai. Vamadeva carries on the teachings of Ganapati Muni, chief disciple of Ramana Maharshi. He is closely associated with Sadguru Sivananda Murty who was head of the Sri Saiva Maha Peetham. He is the director of the American Institute of Vedic Studies (www.vedanet.com).